Although the Native American war shield and the medicine shield looked similar, they had distinctively different uses. The war shield was thicker and heavier and was used to deflect arrows or spears. The medicine shield was also taken along in battle, but they were meant to give spiritual protection. The war shields were said to be between 20-24 inches in diameter, but our version of the war shield is the width of a Styrofoam paper dinner plate. 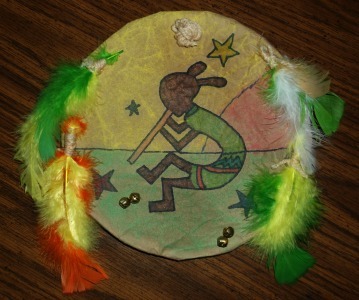 You’ll find the tutorial for this project, Native American War or Medicine Shield, in the 3rd Grade Projects Gallery in the sidebar. This entry was posted in Categories and tagged 3rd Grade, american indian, brown paper bag, Indian, medicine shield, native american, paper plate, project, third grade, war shield. Bookmark the permalink.